A delegation led by Georgian President Giorgi Margvelashvili is in Brussels to attend the NATO summit on July 11-12. President Margvelashvili travelled to Brussels from Turkey, where he attended the inauguration of President Recep Tayyip Erdogan and witnessed Ankara’s all-out support for Tbilisi’s aspiration to join the alliance. The July 11-12 NATO summit is not about defense spending only as it strikes the eye that the support for Georgia’s NATO membership has been growing for some time to make it look like something that could really happen in the not so distant future. For the first time ever in the history of Georgia-NATO relations, high-level meetings will be held with heads of states in presence to address Georgia's security challenges, defense capabilities and prospects for strengthening NATO-Georgia cooperation, the spokesman for the Georgian president said. The talks about the possible outcome of the summit for Tbilisi have been intensifying. Addressing the NATO Parliamentary Assembly in May, NATO’s Jens Stoltenberg said Georgia had all the tools to become a NATO member. Since 2014, Georgia has already enjoyed a privileged status being part of the NATO Enhanced Opportunities Program. At the summit, President Margvelashvili will have bilateral meetings to discuss specific steps that Georgia has to take to accelerate integration with the alliance and strengthen defense capabilities. In his previous statements, Margvelashvili said he expects genuine progress in NATO-Georgia relations from the summit. Georgia appears to enjoy strong U.S. backing of its NATO bid. With a week to go to the summit, U.S. Permanent Representative to NATO Kay Bailey Hutchison voiced the U.S. support for the open door policy and Georgia’s aspiration to join the alliance. Prime Minster Mamuka Bakhtadze also said his country is upbeat about the outcome of the NATO Summit. "We have quite positive expectations from the Brussels summit," the Georgian prime minister said after the Security Council meeting on 6 July. "For the first time in Georgia-Nato relations, Georgia attends all formats of meetings at the level of leaders of all NATO member nations. This is yet another confirmation of the fact that Georgian-NATO relations have advanced to a new footing. It is also very pleasing that for the first time the issue of Georgia will also be discussed in a separate format," Bakhtadze was quoted as saying. He thanked Georgia's friends and the country's diplomats for making it happen. "I believe the agenda of the upcoming summit clearly shows a very significant progress that we have achieved over the past years. I am confident that this will be properly assessed by our partner countries," Bakhtadze added. President Giorgi Margvelashvili reiterated Georgia's declared intention to join NATO. He said that bilateral meetings should be followed by significant steps securing Georgia's membership of NATO. "We demand NATO membership and all relevant steps that accelerate this process. We are starting permanent relations on this issue with our partners and our firm logic is that NATO and the region globally will be more protected if Georgia becomes a NATO member," Margvelashvili said after the Security Council meeting. 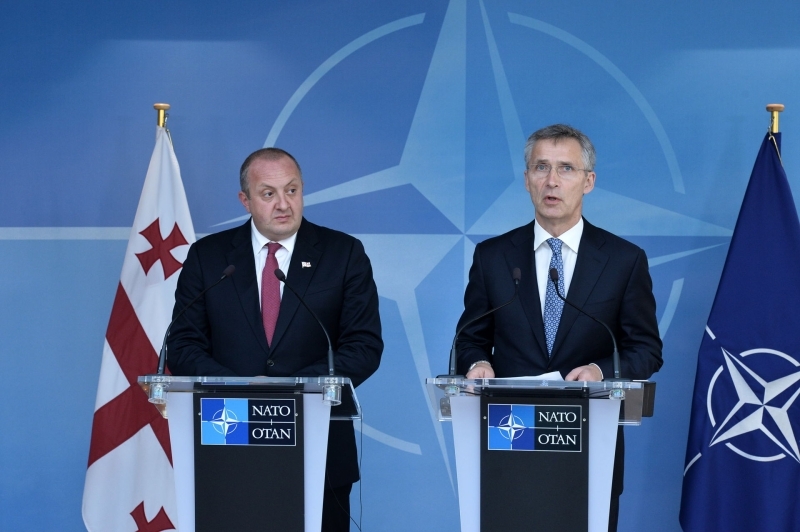 Margvelashvili also hailed as an "unprecedented achievement" that NATO leaders were going to discuss issues related to Georgia's defence and security. We expect that after these meetings, including bilateral ones, planned within the frameworks of the summit, Georgia's progress will be properly acknowledged and that a significant step forwards will be achieved on Georgia's path to NATO membership, Margvelashvili said. Here are some highlights in the history of NATO-Georgia relations: Shortly after Georgia regained independence in 1991, the country joined the NATO Cooperation Council (1992) and Partnership for Peace (1994). Dialogue and cooperation deepened after the Rose Revolution in 2003, when the new government pushed for more ambitious reforms. NATO member states agreed at the 2008 Bucharest Summit that Georgia will become a NATO member, provided it meets all necessary requirements: this decision was reconfirmed at NATO Summits in 2009, 2010, 2012, 2014 and 2016. Following the Russia-Georgia crisis in August 2008, the alliance continued to support Georgia’s territorial integrity and sovereignty within its internationally recognised borders and call on Russia to reverse its recognition of the Georgian regions of Abkhazia and South Ossetia as independent states. The NATO-Georgia Commission (NGC) provides a framework for close political dialogue and cooperation in support of the country’s reform efforts and its Euro-Atlantic aspirations. At the Wales Summit in September 2014, a substantial package of measures was launched to strengthen Georgia’s ability to defend itself and advance its preparations for membership. Further steps to help strengthen Georgia’s defence capabilities were taken at the NATO Summit in Warsaw in July 2016. At the 2008 Bucharest summit, NATO agreed that Georgia will join the alliance but no date was set. The possibility of skipping the membership action plan (MAP) process appears to be quite acceptable. The “more NATO in Georgia and more Georgia in NATO” concept serves as an alternative to a MAP, providing all of the necessary instruments to achieve the goal. The country is a party to the Annual National Plan and the Substantial NATO-Georgia Package (SNGP), which includes support of 13 different areas of defense and security related areas. These programs make a MAP redundant. Tbilisi is ready to contribute into the NATO deployment in Poland and the activities in the Black Sea region. Does NATO really need it as a full-fledged member? The country provides the shortest route to export oil and gas from Asia to Europe. It has contributed to NATO military operations in Kosovo, Iraq and Afghanistan. The Georgian forces in Iraq and Afghanistan were the largest non-NATO contingents to dwarf those of most NATO members. The alliance believes it needs to expand. But NATO needs the ability to fulfill the obligations to defend Georgia if attacked according to the Article 5 of the Washington Treaty. It presupposes an enormous effort, expenditure and confrontation with Russia. This is the case when geography is not on the alliance’s side. Besides, deploying “substantial forces” near Russia’s borders is what NATO pledged not to do signing the NATO-Russia Founding Act. A massive presence of NATO forces in Georgia will turn the country into a hotbed. The alliance is not in the position to do it as it is teetering on the verge of a break-up. There are reasons for NATO to think twice before giving Georgia a membership but the United States sees this nation as a useful ally located in the strategically important region. It is a valuable stopover for transporting forces to the Middle East. This is the time the U.S. is balancing on the brink of armed conflict with Iran. American aircraft could reach the Middle East in a few hours if they take off in Georgia, which has upgraded its key airports and port facilities. America will need it badly as an allied nation to support military activities in the Middle East. There is a serious rift dividing the U.S. and other members of NATO. The alliance’s future is vague. It has never happened before but the differences over defense spending and “free riding” appear to be insurmountable at present. The things could be temporarily smoothed over but the problem will remain. NATO may lose relevance. New alliances may emerge, such as a group of European states led by Germany, the U.S. alliance with pro-American European nations such as Poland and the Baltic States, or the recently emerged “mini-NATO” including Georgia, Ukraine and Moldova. Georgia may find the U.S. major non-NATO ally (MNNA) status even more important than North Atlantic membership. A lot depends on the results of the NATO summit and its fallout. The Trump-Putin summit can also change a lot of things to make Georgia reconsider foreign policy priorities. NATO membership may look to be very close and never become real with obligations to shoulder and no commitments on the part of the alliance in return. This situation has been lasting for a long time with solemn promises to give and new “programs” offered instead of real membership. The MNNA status may be a coveted goal too but what does it change? The country will be told what to do and how much to spend on defense not to be called a free-rider. The U.S. will have a springboard in the volatile region but Georgia’s security would be reduced as it would become a target for Russian military, be it a NATO member or a privileged U.S. ally. If the July 16 Trump-Putin summit ends as expected to launch the process of gradual normalization of the relations, then Georgia will have a slim chance of formally becoming a member of NATO or a U.S.-led anti-Russian alliance. It’ll have to face a new reality as new European security architecture will be emerging. Geographic, economic and political factors dictate the need for launching a dialogue with Russia on new security arrangements, taking into consideration the ongoing changes and emerging trends. This policy will enhance Georgia’s security in a much more efficient way than losing sovereignty to become a pawn in the games plays by NATO or the United States.